It was an exciting day for the children in the Foundation Stage as they popped over to the swimming pool in preparation for their first lessons next week. At the pool the teachers showed them the changing rooms and talked through behaviour expectations near the water in order to ensure everyone stays safe. The teachers showed the children how deep the water was and how to use the shower before going into the pool. It was an exciting session which ended up with the children really looking forward to getting into the water next week!There was more excitement for Mr smith as he took delivery of our new Earls Hall gazebo which we will use at sports events. 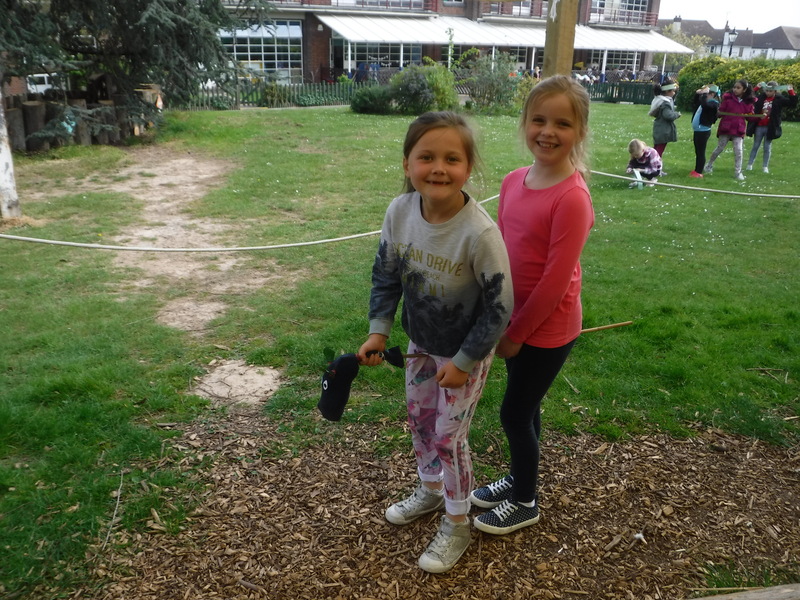 Mr Smith and Mr Town erected the magnificent gazebo on the playground and it looked fantastic!At lunchtime Mr Cann held the first of his ocarina clubs where the children familiarised themselves with the instrument and began to play sequences of notes. Later in the day the children in Hawks and Kites took to the 100m track on the field in PE in order to develop their sprinting skills whilst the children in Sycamore enjoyed a PE lesson where they were taught by both Mrs Ludlam and our new Deputy Headteacher; Mrs Crouch.In Elm the children began investigating the Vikings by identifying on a map areas of the country where they settled whilst in Dormice the children acted out more of their helicopter stories and in Foxes the children used the laptops and beebots to develop their programming skills.At the end of the afternoon Mrs Ludlam was joined in the upstairs hall by parents of children in Year Four as she gave them a presentation about the Year Five PGL trip in September. The powerpoint from the session has been uploaded to the parent letters section of the website. Thanks to everyone who made it along. Our second day of the term began with a group of girls from Year Four taking part in a series of lessons over at Westcliff High School for Girls. The girls walked to the school where they were greeted by pupils from Year Seven who accompanied them throughout their visit. Each of our girls took part in some secondary taster lessons where they experienced aspects of high school life. It was a fun morning which everyone enjoyed. 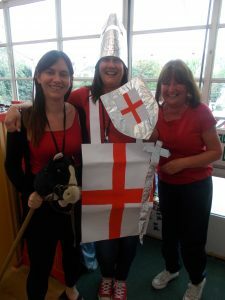 thank you to our hosts at WHSG for taking such good care of our pupils.Meanwhile, following the KS1 assembly where Miss Holmes reminded the children the story of Saint George, the children in Year two used their 'Forest Friends' sessions to create hobby horses from socks and sticks which they then used to act out the story. 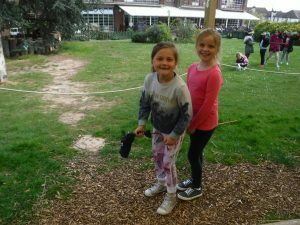 They also worked in pairs and groups to create dragon traps out of sticks, branches, string and rope as well as castles.In the afternoon the children in Beech developed their French skills by learning how to order food whilst the children in Sycamore continued to investigate holy books and the children in the Foundation Stage had fun in the Early Years garden.After school there was plenty of activity outside as the children from across KS2 took part in rounders, tennis and netball clubs. It was a patriotic start to a new term at Earls Hall today as the whole school community came out in force in order to celebrate St George's Day! Our annual celebrations saw the children, who were dressed in red, white, as St George, dragons or other English historical figures, enter the gates to see the school adorned in our national flag whilst 'Land of Hope & Glory' blared at full volume for all to hear, stirring a sense of national pride.In the morning assemblies Mr B explained all about our saints day and worked with the children to identify lots of reasons to be proud of our country. We identified national landmarks which are famous all over the world as well as famous English monarchs and historical figures. We looked at some of the amazing inventions which English people have been responsible for which have benefited the whole world and then worked with talk partners to think of reasons to be proud to live in England whether we were born here or abroad. In the KS2 assembly the children were introduced to Mrs Crouch who joined our team today as our new Deputy Headteacher. Mrs Crouch will work along Mrs Critoph, our other Deputy Headteacher.As the day progressed there were lots of St George activities taking place across the school. Some children studied the story of George whilst others investigated famous English events or people. It was a great start to the term. Thank you to all of our families for once again supporting the celebrations. It was an exciting final day of the term at Earls Hall! The morning started with the children taking part inn our two simultaneous 'Celebration Assemblies' which saw children from each class awarded with certificates for individual achievement. There were certificates for 'Earls Hall Stars', times table and reading efforts and achievements. Well done to all of the children presented with certificates this morning, we are proud of you!In the afternoon the excitement levels hit fever pitch as we were paid our annual visit by the Easter Bunny! 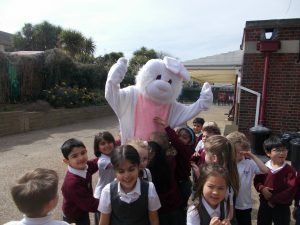 Our fluffy tailed friend visited each class, supported by Mrs Ludlam and Mr Town, in order to deliver eggs donated by our PTA. The children were all well behaved and the Bunny left feeling proud of them for another year.At the end of the afternoon the 'Learning Ambassadors' from each class met with Mrs Irwin; one of our school governors. The children told her all about the learning which has been taking place across the school throughout the week. Well done to all of the ambassadors, we are proud of you!After school the PTA held another cake and uniform sale which this time saw children from across the school invited to take part in an Easter bonnet parade! The children had decorated hats of all shapes and sizes and prizes were awarded to winners from different age groups. Well done to everyone who took part! It really was the end of an era at Earls Hall today as the school said a fond farewell to our lovely Miss Ellacott. Today was all about our amazing Deputy Headteacher as she heads off for new adventures and, as a result, she was the focus of all of the children's love and attention throughout the day.The morning started with Miss Ellacott being surprised in our KS1 and Foundation Stage assembly where the children, knowing all about her up and coming adventure on the Inca trail in Peru, presented her with self made items she may need to complete the trek. The children presented her with maps, pick axes, compasses, walkie-talkies and much more before singing 'One more Step' and giving her flowers. Our nurture group had painted portraits of Miss Ellacott and she thanked them for all of their kind thoughts and hard work.Later in the morning Miss Ellacott was the special guest in our KS2 assembly. 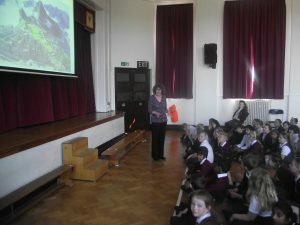 Mr B shared a brief overview of her amazing career with the children before reminding them of the adventure in Peru she has planned. He then showed some ideas of other adventures and pursuits that she may like to take up in her spare time including painting, pottery and even lion taming! Miss Ellacott was presented with a beautiful card which every child in the school had contributed to before Our Head Boy and House Captain thanked her for the dedication she has shown the school for the past seventeen years. Miss Ellacott was then serenaded with 'Consider Yourself' from the musical 'Oliver' in order to remind her that she will always have a place at Earls Hall before she thanked all of the children for being so wonderful to work with.Before lunch we also said farewell to Madam Bass who, having originally retired as a classteacher nine years ago, has decided to fully retire from teaching French to KS1. Mrs Bass was presented with some flowers and sung a special French song by the children wishing her well.In the afternoon Miss Ellacott visited every class across the school in order to say goodbye, thank the children for being so lovely and also to remind them of ways to continue to make us all proud of them. 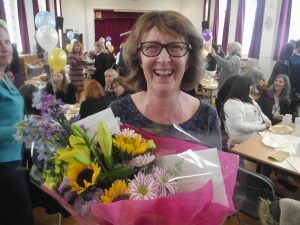 She delighted the Year Six children by revealing that she will be joining them on their residential to Stratford Upon Avon next term after she has returned from Peru.After school the upstairs hall was transformed into the setting of a special retirement tea party for Miss Ellacott. Our outgoing Deputy was joined by current colleagues and friends as well as many former colleagues spanning nearly forty years in education. Special guests included Miss Ellacott's family as well as former Headteachers Mr Eastwood and Mrs Morris. Mr B gave a speech thanking Miss Ellacott for her years of dedication and for being so wonderful to work with before Miss Ellacott took to the floor to say a few wonderful words of her own- inspiring others right to the end! Mr B then presented Miss Ellacott with some leaving presents before she was given a huge round of applause. It was a lovely day at school today. Mr B's morning started as he was surprised in the KS1 assembly with a cake as it was his birthday today. Throughout the day he was treated to lots of lovely cards from the children and even a special birthday show in Hedgehogs!At lunchtime there was a special visitor in school as Miss Patching brought baby Elliot into school to say hello for the first time. Elliot was beautifully behaved throughout his visit where he met some of Miss Patching's friends and then visited the children in Foxes and the Foundation Stage where they asked her questions about how he is looked after. It was lovely to see both Mummy and baby, thanks for coming Miss Patching!In the afternoon Year Five was a hive of activity as the children continued to make their movable toys based on Victorian models. Some children used the glue gun and saws to create their frames whilst others painted and cut the shapes which will be stick to it before the wheels are positioned on their axles. It was a loud an awesome day for may at school today as the children in KS2 enjoyed their 'Fluorescent Discos'. Part of our annual Easter schedule, the children took to the hall in two sessions in order to join in with the fun. The children in Years Three and Four were the first to take to the dance floor in the afternoon before the children in Years Five and Six strutted their stuff after school had finished for the day.The teachers and teaching assistants were on hand to demonstrate their moves as well as to run the shop full of goodies to enjoy.It was once again a great success and fun was had by all. Thanks to Micky B for sharing his DJ skills with us as always!Meanwhile, outside in the Forest Friends are and Early Years Garden, the children in the Foundation Stage enjoyed an Easter egg hunt. The children worked in teams in order to see which class found the most eggs. The last week of the term began for the children in KS2 with an assembly, led for the final time by the lovely Miss Ellacott. 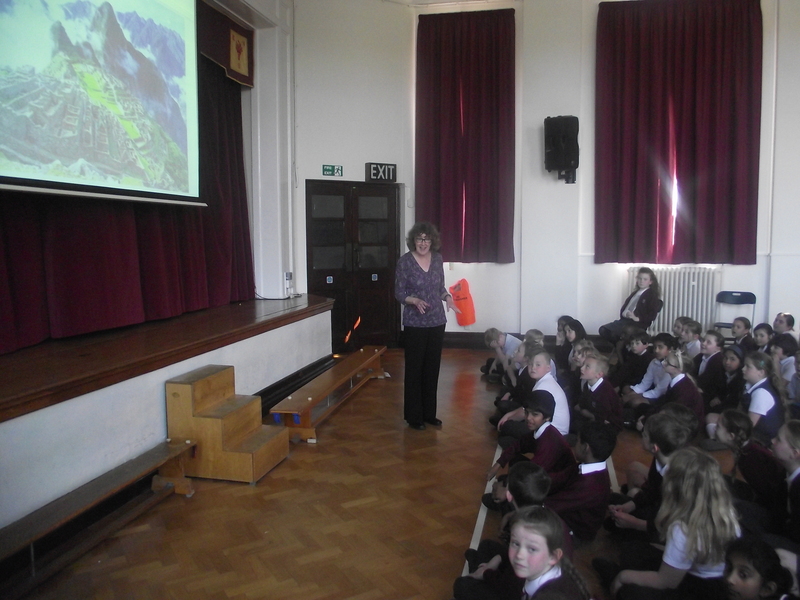 Our long serving Deputy Headteacher retires on Thursday and so used the time this morning to tell the children all about some of the adventures that she has planned for after she has left us.In just eleven days Miss Ellacott explained that she will be completing the Inca Trail. The Inca Trail to Machu Picchu is a hiking trail in Peru that terminates at Machu Picchu. It consists of three overlapping trails: Mollepata, Classic, and One Day. Miss Ellacott explained that the trail will take her four days to complete and will be a massive challenge! We are delighted that Miss Ellacott has agreed to return to school in order to tell the children all about her adventure once she has returned and rested!At lunchtime Mrs Ludlam and Mrs Dolman dined at the centre table of the 'Woodland Diner' where they were accompanied by children who they had witnessed displaying excellent manners. Well done children, we are proud of you!Later in the day the children in Kestrels continued to investigate volcanoes. They began planning an explanation text where the children worked in pairs to create a flow chart about the events which lead up to the formation of a volcano. It has been a busy end to the week full of reasons to celebrate! On Thursday morning the children in Foundation Stage and Year One invited parents into the classrooms in order to see how we develop writing in school. Thanks to all of the parents who came along. On Thursday afternoon a group of children from our KS1 choir were accompanied by Mrs Bowden, Mrs Critoph, Mrs Russell and Mr B to the infant 'Music Festival', once again held at the Freight House in Rochford. 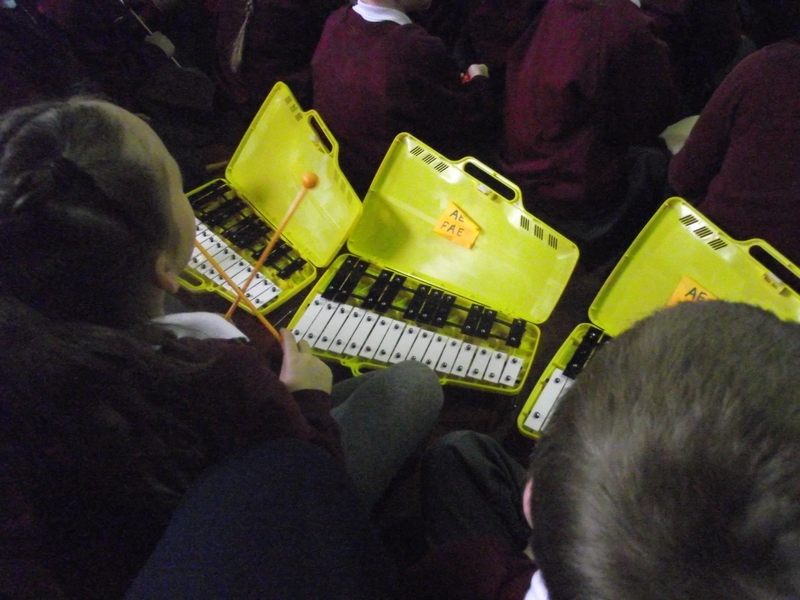 The children were joined by three other Essex schools and sang group numbers, playing percussion instruments to one, and performing two individual songs on the stage. Proud parents and other family members watched and a great time was had by all. Well done to all of the performers, we are proud of you.On Thursday afternoon, after school, Mrs Linfield and Miss Ellacott hosted 'Tennis Club' whilst Mrs Cockett held another 'Craft Club' where children decorated cakes.On Friday morning the children gathered in both halls in order to take part in our 'Celebration Assemblies'. Mr Geach and Mrs Cockett presented 'Earls Hall Stars' certificates to individual children from every class in recognition of their effort and achievement. There were also certificates presented for times tables and reading races. Well done to all of the children who were presented with certificates, we are proud of you!Over the last three days the community room has hosted 'Mothers Day sales' so that children can purchase gifts for their Mums and other special ladies in their lives. The sales have been a great success, thank you to all of the PTA volunteers who gave their time to the sales.This morning the school was visited by Cllr Boyd who has a responsibility for children and learning within the council. Mrs Boyd is a former Earls Hall pupil so, along with taking a trip down memory lane, was interested to hear all about the developments of the school and took time to talk to some children about their learning.This afternoon we announced our latest group of prefects who will take responsibilities across the school. Mr B informed all of the children in Year six that our third and final group of prefects will be announced very shortly after the Easter holidays. Well done to all of the children chosen, we are proud of you! Welcome to the brand new ‘Earls Hall Primary School’ website. News stories will be uploaded every evening to give visitors an insight into what learning has been taking place across the school. The dinner menu will be updated every Sunday and the latest newsletter will be available to read every Friday. More information will be uploaded over time. We hope you enjoy using our website. If you have any questions then do not hesitate to contact us at school! Error: Error validating access token: Session has expired on Thursday, 09-Aug-18 14:03:25 PDT. The current time is Thursday, 25-Apr-19 16:03:33 PDT.